This Bible lesson plan about honoring your father follows our new hassle-free format. The basic version makes it easy to teach with very little preparation or outside materials. We’ve also suggested more activities so you can expand the lesson to best fit your ministry setting. Don’t miss our growing collection of father’s day ideas for church. Printer Friendly: [print_link] this lesson. Gospel Connection: Like all the commandments, only Jesus lived in perfect obedience. As children learn about God’s standard of righteousness, the Holy Spirit will often convince them of their own sin. At those moments the answer is not “obey better” but look to Jesus. We can trust in his righteousness to cover our shortfall. Only his grace can transform our natural rebellious hearts to rightly honor our earthly and heavenly Father. Learning Aim: After this lesson, children will verbally identify one specific ways they can show honor to their fathers (or primary caregiver.) Look for the Learning Outcome Test section in our Basic Teaching Plan below. Target Age: Our super simple lesson plans are broadly graded and easy to adapt for a variety of children’s ministry settings. Look for specific adaptations within the Basic Teaching Plan below. A marker board or piece of paper attached to the wall to display the word “HONOR.” This is used in the Lesson Introduction below. (Optional) Collect a series of hats or props to be used in the Role Playing Honor activity below. The children who volunteer to play each role will wear the hat as you explain the meaning of honor related to their character. Suggested props: Soldier’s hat, pastor’s neck-tie & Bible, school teacher’s sweater-vest & chalk, judge’s robe & gavel, a ball-cap for a school friend. (Optional) Instead of the list above, you could simply write the words for each character (or print a picture from the Internet) on a piece of paper and ask the child to hold it in the Role Playing Honor activity below. Think ahead a time when you did not honor your father as a child. You will need to briefly share this story during the Gospel Application part of the lesson plan. The optional activities at the end of this lesson may require additional supplies. Carefully read the directions while preparing your lesson. Other Notes: In the teaching plan below the words in italics are meant to be read aloud. The regular text is simply directions for the teacher. Be sensitive to children who do not have a father in their home. In such cases you can often substitute grandfather during the activity Discerning Honor below. If this is a challenge in your ministry you could simply refer to parents. We suggest your read our article about Father’s Day and Children who have lost their Dad. Soldier: When an army soldier comes into a room what hand signal do people sometimes make? (allow for response) Let’s all stand and salute this soldier. This salute is a way to show honor and means that we know that soldiers are important people who risk their lives to keep us safe. Pastor: When a pastor begins to pray what do people normally do with their hands and eyes? (allow for response) Let’s all close our eyes & fold our hands like this pastor is leading us in a prayer. Our folded hands and bowed eyes show respect for the pastor & for God during prayer. This is like saying with our body that our pastor is an important person who helps use to know God better. Teacher: What are you supposed to do in your classroom to answer a question your teacher asks? (allow for response) Let’s all raise our hands together like we have an answer for this teacher. When children raise their hands this shows honor for the teacher because they have an important job helping you to learn. Judges: What do people in a courtroom do when a judge walks into the room? (allow for response) Let’s all rise to show the importance of this judge. This standing up lets everyone know that judges have important work helping the world to be a more fair place. Friend School: What do you do with your hand when you see your friend across the park. (allow for response) Let’s all wave to our friend together. When we wave our hand it shows that we’re happy to see our friend. It means our friend is important because we like to be around them. Thank the volunteers for helping act out the characters and allow them to return to their seats. Defining Honor: Explain to the children in your own words how honor means acting out that someone else is important. It starts with an attitude but it’s also something that comes out in the way we behave around toward that person. (Optional) We have suggestions for memorizing this verse in the optional activities below. Discerning Honor: Ask the children to respond to the following statements. If they sound like good ways to show honor they should stand and salute the teacher. If they are not good ways to show honor the children should remain seated. You may want to create a few of your own statements. Say: In each of these, it’s important to act in ways that shows your Father is an important person. That’s what it means to honor your Father. Gospel Application: Share a personal story of a time when you did not show honor to your Father. Talk about how that was breaking God’s law and you needed Jesus to forgive that sin. Explain that Jesus had a father while he was on Earth too named Joseph. We know that Jesus was the only child to every perfectly obey his father. So Jesus can forgive our sin and help us become better children to our father. Learning Outcome Test: Ask each child to silently think of one specific way they can show more honor to their father. As time allows, have them share their answer in smaller groups with your adult leaders. Close this part of the lesson in prayer . . . .
We need your help! All the Bible materials on our website are open for improvement. Often our best ideas come from readers just like you. Simply leave a comment below with any corrections to this lesson or more suggestions that will help other readers. Coloring Pages: Our website hosts a variety of coloring pages for Father’s Day. These are all 100% free to use in your church, home, or school. The children can complete these and offer them as gifts after the church service. Craft Ideas: We have listed and linked to several father’s day crafts. Any of these would be an appropriate addition to this lesson plan. Dads Deserve Honor: Revisit the characters used in the Role Play Honor game above. For each one ask the children to describe how their father plays a similar role in their family. For example, dad keeps the home safe like a soldier keeps the country safe. Ask the children to act out different situations where the father would be like these characters. Bible Memory: Use any of our creative methods to help the children memorize the short Bible verse from this lesson plan. Poem Recital: Lead the children to rehearse and briefly perform this poem for the fathers in your church during the worship service. Prodigal Son Video: Watch this short video clip that tells the story of the prodigal son. Discuss with the children how the boys behavior failed to show honor to the father. You could also explain how the father continued to love his son, even when he was very wicked. This could lead into a whole new Gospel application. 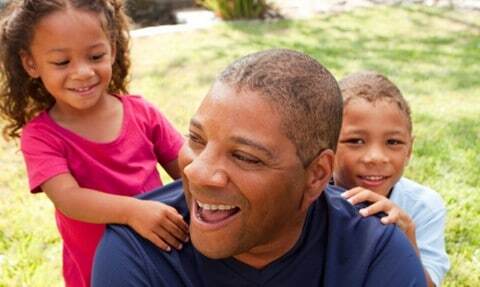 Father’s in the Bible: Ask the children to look up Bible stories about fathers in the the scriptures. For each of these you could discuss the different ways the children showed honor to their Father. This activity is better suited for older children. Know your students and use your best judgment. Toward the end of this lesson, you’ve directed the teacher to explain to the children how Jesus Christ had a father to honor also… Joseph. This is a wonderful lesson in teaching children to honor their father, mother and God; but Joseph was NOT the father of Jesus. Jesus Christ was born of a virgin (Matthew 2:23KJ), other wise He would have had sin and He would not have been able to die for my sin and be my Lord and Saviour. We just need to be very careful in what we teach our children…. and some teachers. We even need to be very careful in how we word what we say. The Bible is God’s Word, and it’s very important that we teach EXACTLY what it says. Besides that, my wife and I have enjoyed reading over many of these lessons; we’ve been called into the ministry of teaching the children in our congregation, it’s a blessing, and these lessons are a big help with great ideas. Thank you… Jason and Carla Brown. Bible Baptist Church, Greendale, IN. I think the intent was this – Jesus had a foster dad whom he honored. Joseph was not perfect, but Jesus respected him in order to show his respect for the Father in Heaven. Amen! In a day and age where we have a lot of blended families, thank God for those men who step up to be fathers children who are not their biological seed. Joseph, not being the biological father of Jesus did not neglect his role to provide Jesus with the nurture and guidance that all parents should strive to provide for their children. Again, how do you parent Jesus? Only Joseph and Mary really know. But thank God for their sacrifice and their willingness to be used by God for a purpose greater than themselves. I have been teaching children for over 25 years now and I teach that Joseph was also Jesus’ father. I have no children but my wife had 3 when I married her. I am their father even though I did not “father” them. I am the head of my household which includes being husband to my wife, a spiritual leader to my family, and father to our children. Can you imagine Jesus saying “I don’t have to listen to you. You’re not my father!” I think not. We can still teach truth if we slow down, take a step back, and ask the Holy Spirit to guide us in our teaching.